The user interface of your project is what end users see at forio.com/app/your-user-or-team-id/your-project-id when they play with your model or simulation. The user interface includes both the components on the pages (charts, text, forms, images, etc. ), including their layouts and styles; and the connection between those elements and the project's model. The Multiplayer APIs are for creating multiplayer worlds, adding end users to those worlds, and starting runs for those worlds. 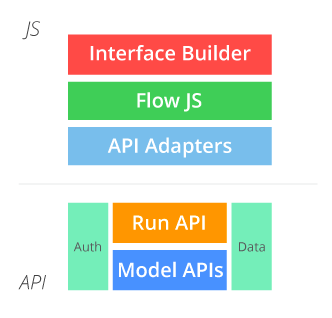 The Other APIs section includes "everything else" — such as account and project information and the set of Model APIs that underly the aggregate Run API, Epicenter.js, and Flow.js. With Epicenter, you have the option of creating your project's user interface with Interface files, rendered on the client-side, or with Node.js, rendered on the server-side. Create or upload these files to the Interface section within your project. Files added to the Interface section within your project can be accessed (read) through the user interface of your project, or with the exact URI. For additional security, add a new folder in the Interface section and name it "protected". Files added to the "protected" folder are accessible only to end users who are logged in to your authenticated project. See sample code by creating your interface with the Interface Builder, then look at the files created once you save your work. This component of your project is optional, but in some cases can increase performance and improve the maintainability of your code. For example, you might aggregate API calls, perform validations, or execute other repeated tasks on the server-side. See a sample of how to use Node.js with your project. Part of the sample includes details on how to enable Node.js for your project.